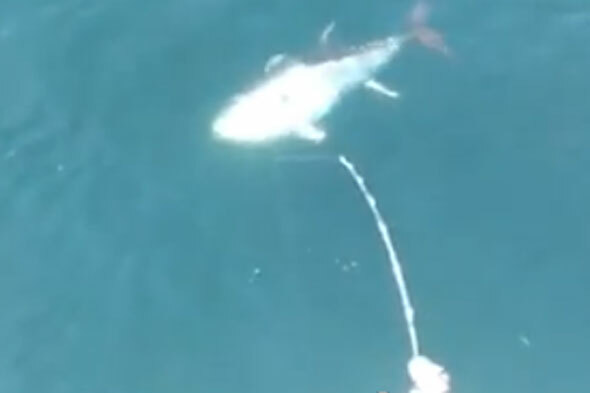 A video of three fishermen catching a six-foot-long tuna in Cape Cod, America has become an online hit. The footage shows the fishermen reeling in the fish weighing over 900lbs. According to RTT News, it took the men three hours to catch the fish and they took turns rotating every 10 to 15 minutes to reel the tuna into the boat. "I can't believe this happened to us. It's a once in a lifetime gift," Allan Gourley told WBZ. The three friends say they have turned into celebrities. One of the anglers Michael St. Jean: "I'm getting phone calls from people I don't even know." He added: "What it did is it ruined us, because now we're going to go out and we'll never catch a fish like that again." The men reportedly sold the tuna for $4,000 (£2,584) once they reached dry land.